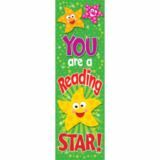 Send positive messages to children and encourage reading with clever, engaging bookmarks. They feature favorite characters and bright colors with room to personalize on the back. 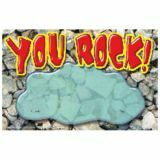 Keep a variety on hand to motivate reading, reward good behavior, and recognize achievement. 2'' x 6 1/2''. 36 per pack. 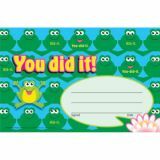 Ready to customize with student drawings. 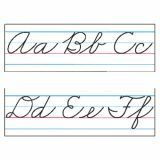 Uppercase and lowercase letters and numbers 0-10 on 15 pieces. Complete set is 8" tall and 18' long. Cards are drawn...points are added...do you stop or keep going? 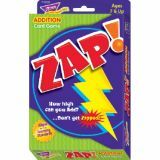 Draw a ZAP! card and lose it all! This fun, suspense-filled game reinforces addition skills, builds subtraction skills, and develops an awareness of probability and chance. Aligns with learning standards. Ages 7 and up. It's the math game with quite a forward/backward twist! Players add cards and watch out for wild cards that can send their scores zooming forward, backward, or stall a turn. 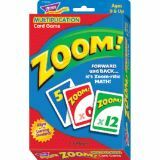 Builds multiplication skills, use addition skills, and apply probability strategies. Aligns with learning standards. Ages 10 and up.